joy magnetism: Lo so! Pazzo! Perhaps our best day in Florence was visiting Basilica di Santa Croce (Basilica of the Holy Cross). Everyone was getting along, no one was overtired, and we were really enjoying what we were seeing. 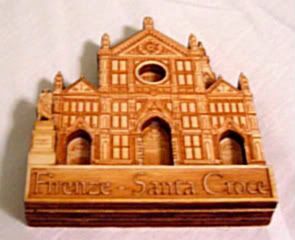 Santa Croce is where Michelangelo was buried, as I've magnetblogged before, but I wanted to use this other magnet because whoa, there's a new Michelangelo in town. Well, sortakinda. It's not technically new, because it's been here since before I was born. And, it might technically not really be a Michelangelo. This really interesting ARTnews article is about Everett Fahy, the former head of the Met's European paintings group, who wrote a paper about how the Met's Saint John the Baptist Bearing Witness could supertotally actually be a Michelangelo. Back in 1970, the Met bought these two paintings by Franciso Grannaci from Sotheby's, one for $150,000 and the other for $200,000. The one for $200,000 wasn't technically attributed to him, but like someone in his close circle of friends....that just happens to include Michelangelo. So, apparently Fahy has kinda always had his eye on the painting wondering if it was really Micheangelo, until one day, things kinda clicked and he put some pieces together, and he just sort of gradually realized it. So they've done all sorts of studies, and they started doing all sorts of techy tests, trying to examine the paintings further. One was trying to see if the underwriting (where some artists draw out what they want to paint, and then they paint over it) was visible. Apparently, while Grannaci did that, Michelangelo (cuz he's Michelangelo, hello) did not. According to them, he knew what he wanted to paint. So, when you see all the underwork stuff, you can see that the John the Baptist one didn't have the initial drawings. I'm trying to figure out why this isn't the most fanfare-iest news ever, and why more folks haven't like freaked out over it. That's way cool that we have a Michelangelo in our backyard. Oh, I suppose when it comes to paintings that were supposedly done before the Sistine Chapel in the early 1500s or so, unless ya'll have the Doctor and his TARDIS to go back in time, you're never going to know 100% that it's Michelangelo's. Still, it's enough to get me over to the Met as soon as I can get there. I kinda want to go right now. Hmmm. Stay tuned. And yet again, I love living here because I can make that last-minute decision to run up to the Met and check out the painting for myself. I love how it sits in relative obscurity in the last gallery (#7) in the back on the second floor. I was able to hang out for as long as I wanted, great bench seating, and like no foot traffic. The security guard knew I was hanging out for a reason, and was like, you know? And I said, yep, I just read the article. I told him to watch out, once that article hits the mainstream and more people find out, you won't be able to get into the room. We agreed that they'd probably pull it from the collection in order to find a place of honor somewhere...not in the back. Hahahah. BTW? Not surprisingly, I really couldn't tell the diff between the Granacci and the Granacci/possibly Michelangelo. But, the painting's really cool, the longer you stare at it.